When I was a child, my mother would announce on Ash Wednesday, “Since it’s Lent, I would like all you kids to give up something for the next 40 days that would be meaningful to you, something that would be a sacrifice.” I wanted to give up going to church on Sundays, but my mother suggested that I give up arguing with my sisters. Hmmm…. There was also the announcement that we would be limiting our meat intake, especially on Fridays when she would serve fish. My sisters were carnivores and would always grumble about the lack of animal protein to be had. This was fine by me, however, since I decided when I was 9 years old that I was a vegetarian who liked fish. I’m not a vegetarian anymore, although I don’t think there’s anything wrong with not eating meat. Your body will tell you if your not getting enough of something. But every time Lent rolls around I think about fish on Fridays. I make fish for my family once a week and I am thankful they like it. 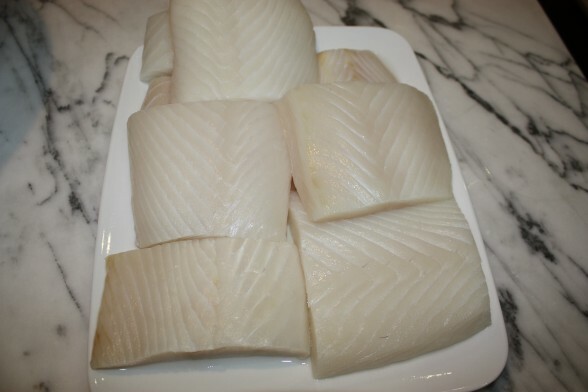 Halibut, especially, is a favorite since it is so mild and works with many different flavors. 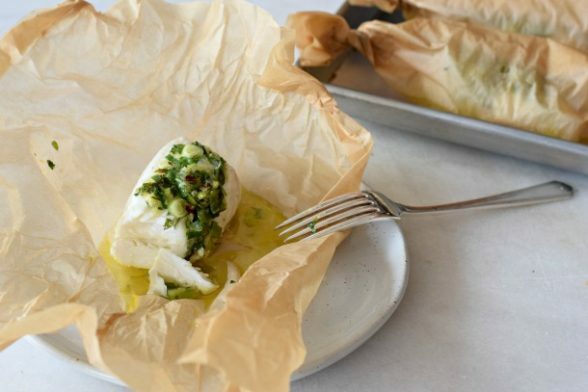 Cooking fish in parchment, or en papillote, is one of my favorite ways to prepare it. Not only is it easy, the parchment keeps all the moisture inside the little packet to basically steam the fish and make it really moist. Plus, it is a really gentle way to cook fish and protect the wonderful Omega-3 fats that we all need. 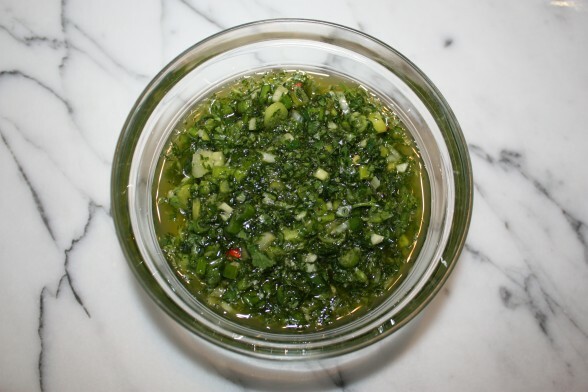 I love the combination of cilantro, ginger and green onions, but the recipe works just as well with mint or a mix of cilantro and mint. Even though I can easily customize each parchment packet, I make everybody’s the same. If Mr. Picky would like to scrape off his herb mixture, he can (and he does.) But there are unlimited ways to flavor your fish if you tire of this recipe. A drop of olive oil or butter, a squeeze of lemon, lime or white wine, a few fresh herbs, salt and pepper and that’s a delicious and light dish. You can even add some quick-cooking vegetables to the packet, such as thinly sliced zucchini, carrots, spinach leaves, or leeks and you have a one-packet meal. If it’s a long work day for me or if we have a Little League game just before dinner, I’ll assemble my packets in the morning and refrigerate them. Take them out before you preheat the oven and bake them for an extra minute since they’ll still be a bit cold. It’s like someone gave you a gift, in more ways than one. 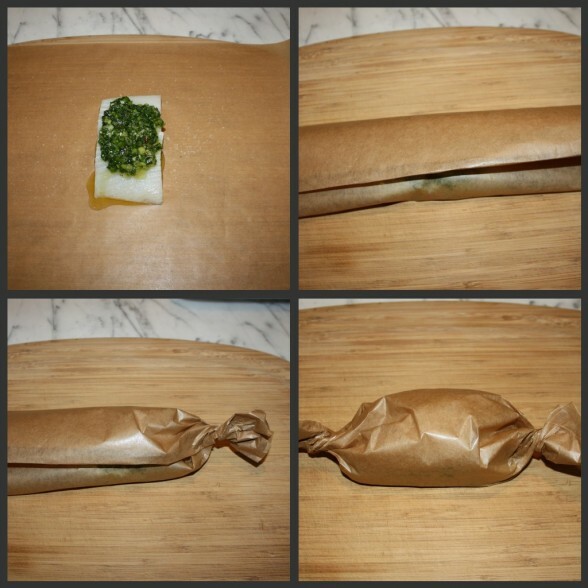 Place each piece of halibut in the center of a sheet of parchment. Season lightly with sea salt. In a small bowl, mix together the remaining ingredients until well blended. Place a heaping spoonful of the mixture atop each piece of halibut and spread evenly. Bring 2 opposites sides of the parchment together and fold. Continue to fold all the way down until you reach the fish. Twist both ends of the parchment so that it looks like a hard candy wrapper. Place each packet on a baking sheet and bake for 15 minutes. Transfer each packet to a plate and use caution when opening – the steam will be very hot! You can also add thinly sliced vegetables to the packets and cook with the fish. *If you are using pieces of fish that are bigger than the recipe specifies, you may need to make a little more of the herb mixture. I would also consider baking the fish for an extra minute. Will you please remind me of the website you have posted in the past for the fresh frozen halibut and salmon? Do you still buy from there at this time of year when halibut is out of season? I still buy frozen wild salmon and halibut from Vital Choice online. Costco has good frozen wild halibut, too. This dish was a TOTAL hit! My husband declared it “the best” fish I’ve ever made … I’m pretty OK with fish. Even my 4 year old who saw green that wasn’t broccoli and was refusing to try it finally relented and admitted that it was “yummy! !” Triumph with one your recipes yet again!! Thanks! Kelly, Now that you nailed this recipe, try other flavors and vegetables in the parchment next time (herbs, pesto, julienned veggies, and the like). Have fun! I made this with black cod because the market did not have any halibut and it was delicious. Love black cod! Thanks for the great tip. This truly is one of my favorites! Since Pamela did this in my cooking class over a year ago, it is a staple in our house! And, the best thing about it (besides the yummy yummy flavor) is that because it’s wrapped in parchment, it holds the moisture and the smell – NO FISHY smell in the kitchen! I never thought about the fact that cooking in parchment doesn’t leave a fishy-ness in the house. Good point! Can’t wait to try this recipe. Do you ever cook salmon in parchment paper? If so, what herbs or veggies do you like with it? Thanks. You can absolutely cook salmon in parchment paper! I use a lot of wild sockeye salmon which takes a little less time to cook than halibut, maybe 10-12 minutes. I am partial to dill and parsley with salmon, but mint and cilantro go well, too. Add lemon juice, white wine, olive oil or butter, and a little salt and pepper. So many vegetables work well with salmon — you can add snow peas, thinly sliced baby bok choy, carrots, zucchini, cherry tomatoes, leeks, mushrooms, corn…….have fun! This looks great and simple to make, I can’t wait to try it. You mention the use of unbleached parchment paper. I have not been able to locate it at my local grocery store or Whole Foods. Would it be safe to substitute the bleached variety? If not which stores do you find the unbleached paper? Thanks. There’s a brand I buy at Whole Foods called “If You Care.” I believe the 365 brand is also unbleached and there’s another I’ve seen called “Beyond Gourmet.” I do avoid bleached parchment paper since chlorine is used to bleach it and the result is the formation of dioxin, a very toxic chemical which is neither good for you nor the environment. “If You Care” also makes unbleached parchment muffin tin liners. You call for “sea salt” in most of your recipes. When would “kosher salt” be used instead? Good question! I love sea salt because it is essentially an unrefined salt. Many trace minerals are present and it has a clean, soft flavor. My favorite is Celtic sea salt which is a light grey color. But I also use Himalayan pink salt. It is more expensive, however, so when a recipe calls for salt that will be used in a large quantity, such as my baked potatoes, or used in a liquid that will be thrown away, such as pasta water or a marinade, I opt for an additive-free Kosher salt, such as Diamond Crystal. One of my favorites!! I make this dish often!! So delish!! 10 to 12 minutes was enough. It’s always a good idea to know your oven. Thanks for the feedback!